Makes shifting more positive at the expense of slightly stiffer shift lever action. The stronger detent spring rotates the shift drum faster, so the gears are more likely to engage under quick shift conditions. The roller bearing lever eliminates the friction of the original pin roller, allowing the shift drum to rotate quicker more positive shifts. This is especially helpful in decreasing the 2nd gear and shift fork wear that the FJ1100's, FJ1200's and other bikes with large, heavy transmission gears are so well known for. 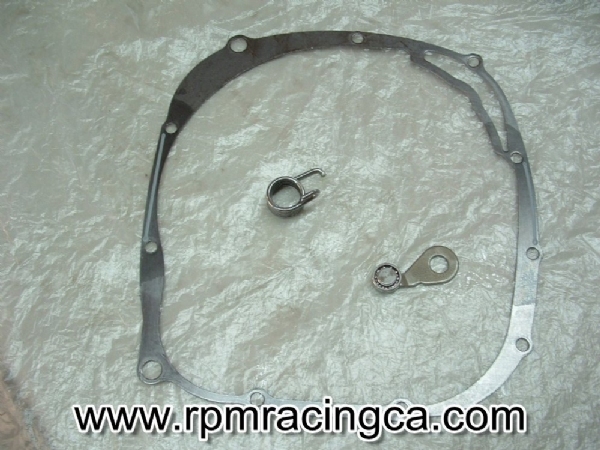 Includes: Roller Bearing Detent Arm, Stiffer Detent Spring and Cometic Gasket. Great kit. Turned my sloppy, numb feeling gear changes to crisp, positive new bike feel shifts. As usual, Randy's service was impeccable. Thanks. An easy installation that makes more positive up and down shifts. I've not noticed any additional shifter effort, just a nice click as the next gear is engaged. Highly recommended for those with an '84-'86 FJ. Is it worth the expense and effort to fit it? Recommended for spirit riding, you get faster & more precise gear selection, and for FJ 1100 & 1200 1TX for the sloppy 2nd gear.